Omg... YUM! I adore chocolate chip cookies. I've never told anybody this, but I honestly just like the cookie dough without the chocolate chips rather than with them in. I do love chocolate, but I love butter/sugar based pastries and I feel that chocolate takes away from it rather than adds to it. Perhaps, though, now that I'm really thinking about it, it could depend on the quality of chocolate you're baking with. Worth experimenting! These look delicious, by the way. I'm inspired to make some this week. My son will love it-he's 2 1/2 years old and just discovering the benefits of "helping" mommy bake sweets. Lol. There's nothing like the classic chocolate chip cookie! Every Monday should involve chocolate chips, am I right? Yum! I'm pretty OK with Monday-Friday being chocolate chip day, and Saturday and Sunday being Oreo day....sound good to you? Yummy! I love chocolate chip cookies! I am totally craving cookies now! YUM! I want cookies so bad now. I love adding a little bit of seasalt for a salty and sweet combo. They look so delicious ... !!! Every Monday should be chocolate chip Monday! These look DE-LISH! These are my favorite thing in the whole world. I have a recipe that adds Oreos (we call it the turducken cookie around here) & it kills me every. time. I have heard some people that higher quality chips make all of the difference, but I've never tried it so I can't really weigh in. 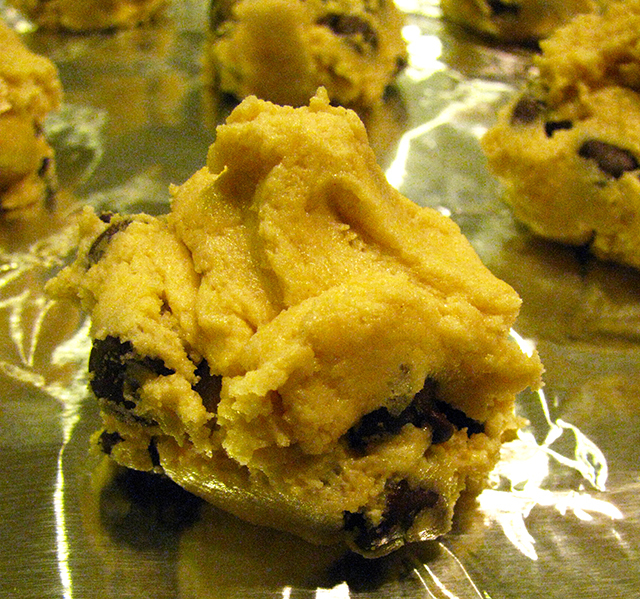 I do usually leave some of the dough sans chips because I like a plain cookie now and then too!